No homeowner wants to deal with the hassle of a broken garage door. It’s a fact of life, though - sooner or later, something’s going to go wrong. Whether it’s a broken spring, a malfunctioning opener, a misadjusted safety sensor or a dented door panel, your garage door needs to be looked after carefully. This is essential not only because it’s awkward to deal with a door that doesn’t work, but because it can be dangerous, too. If this system isn’t kept in reliable working order then hazardous faults can start to occur. You can’t plan when a problem will happen. Many common garage door issues happen suddenly and without warning, such as an opener that refuses to work one morning or a spring that breaks overnight. You can’t afford to wait for ages while a solution is put together - you need assistance straight away. Because of this, our team is ready to offer same-day assistance for emergency problems that need urgent resolution. We don’t want to keep you waiting over the weekend, either, so our team provides professional garage door repair services 7 days a week. 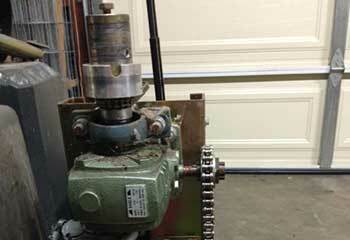 Any machine that’s as large and complex as your garage door needs to be totally reliable. This is especially important with any piece of equipment that hoists a 150lb+ weight overhead door several times a day - you must be able to trust that it will work perfectly each and every time you need it. Every part of the garage door system plays a part, so it’s vital that throughout the system only top-quality parts are used. With our long history in the industry we’ve developed links with manufacturers who we know and trust to deliver top-quality components. It’s these companies that we turn to when we need parts for our customers’ systems, so we can be sure we’re delivering the quality our customers deserve. A new garage door opener is a great way to improve the convenience and security of your home. Modern units come with a wide range of improvements over their predecessors; they’re faster, stronger and more reliable, and can also be fitted with a range of smart technology that further enhances their abilities. There are many different garage door opener models from manufacturers like Genie, Liftmaster and Chamberlain, but it can be hard to work out exactly which unit is right for your home. Our team is on hand throughout the process to guide you to the right decision, and will arrange for a full professional installation to be carried out. To improve the curb appeal and security of your home, a new garage door is always a great investment. With a huge variety of options on the market, from wood and plastic to aluminum or steel panels, there’s a new overhead door to suit any home. Deciding which one is right for you isn’t always straightforward, though, and the in-depth advice of our technicians is invaluable for ensuring you choose the right unit for your property. 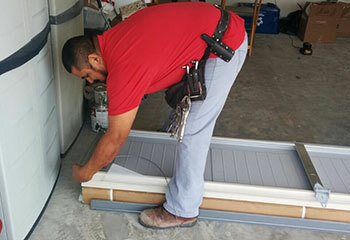 Once you know what you’re looking for, our team will conduct the new garage door installation to our high professional standards, ensuring smooth operation from the very first day. 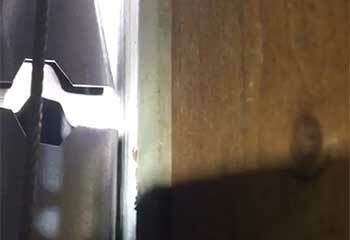 When the garage door springs break, it can be a really difficult issue to overcome. These components should never be handled by untrained personnel, so even if you’re tempted to try your hand at DIY spring replacement we advise strongly against it. Our team will be on hand quickly to provide a new torsion or extension spring, which we’ll fit safely and balance correctly before testing the whole system thoroughly. If your garage door springs are beginning to wear out or are showing signs of weakening, be sure to contact our team for a checkup appointment. Overhead door systems are complicated machines consist of many moving parts, and need to be carefully maintained to ensure they’re working reliably. Regular checkups are essential to guard against garage door problems that develop over time. Our service technicians will help you avoid expensive, stressful repairs by applying lubricant to moving parts, assessing and replacing any damaged or worn components, checking the balance of your garage door springs and much more. Finding and fixing problems quickly is essential for any garage door repair service, because you need the system working as fast as possible. Dealing with a door that doesn’t work, or can’t be relied on, is frustrating. After many years of working on doors of all designs from many different manufacturers, our technicians have the skills to quickly pin down the root cause of any issue. We’re proud to offer a fast, effective garage door repair service in Tuckahoe. Have a look below for information on some of our latest jobs. When a customer’s cable snapped, they called us. This customer called us to come and replace a broken panel. When this customer’s opener broke down, we were on hand to fix it. I didn’t believe that you could get our garage door looking like new again but you did it! Thanks for the help finding and installing the new panels. You've got my recommendation if you ever need it. Thank you for making this experience so much easier for us. We're very happy with your service, the new panel looks perfect and the door is closing properly again. Well done! A big thank you for all your help with my garage door problem. I am thrilled to have found such an honest company, thanks for replacing my broken springs, the door hasn't had an issue since.